What Is Electro-convulsive Therapy, ECT? 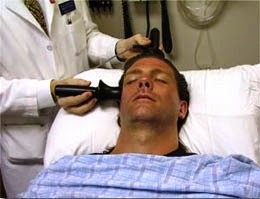 ECT involves placing electrodes on the temples, on one or both sides of the patient's head, and delivering a small electrical current, with the patient sedated or under anaesthetic. The aim is to produce a seizure lasting up to a minute, after which the brain activity should return to normal. Patients may have more than one treatment a week, and perhaps more than a dozen treatments in total. Modern ECT is used primarily in the treatment of severe depression, and psychiatrists say it has proved the most effective treatment in many cases. It has also been used in some cases of schizophrenia and mania but is no longer recommended for the former in the UK. But mental health campaigners say that, although it may work in the short term, it is unclear what its long-term effects are. What Are The Risks Of ECT? Charity Mind says ECT is often used against people's will and it wants to see a ban on this, but psychiatrists say that would mean about 20% of patients who now receive the treatment would not get it despite being most in need. They argue that some people are incapable of giving or denying consent. The first official figures for ECT to be released for eight years show 2,800 people in England and Wales were given the treatment in the first three months of 1999. Most were women, many aged over 65, and a quarter were detained under the Mental Health Act. Of the latter, 59% received ECT against their will. The death rate from ECT used to be quoted as 1 for every 1,000 patients, but with smaller amounts of electric current used in modern treatments, accompanied by more safety techniques, this has been reduced to as little as 4.5 in 100,000 patients. Patients are treated with short-acting anaesthetics, muscle relaxants and breathe pure oxygen. However, despite the fall in death rates, there are still side effects to the treatment. The most common are headache, stiffness, confusion and temporary memory loss on awaking from the treatment - some of these can be reduced by placing electrodes only on one side of the head. Memory loss can be permanent in a few cases, and the spasms associated with the seizure can cause fractured vertebrae and tooth damage. However, the recommended use of muscle relaxant nowadays makes the latter a very rare occurrence. Patients can also experience numbness in the fingers and toes. A common argument against ECT is that it destroys brain cells, with experiments conducted on animals in the 1940s often cited as evidence. However, modern studies have yet to reproduce these findings in the human brain. Some activists, however, still campaign against the widespread use of ECT in psychiatry, quoting those cases which have resulted in long-term damage or even death, whether because of the built-in chance of problems, or through errors by doctors. Experts say that given the correct staff training, and when used for the right clinical conditions, ECT can "dramatically" benefit the patient. An audit of ECT in Scotland between February 1996 and August 1999 said concerns about unacceptable side effects, effectiveness of the treatment and disproportionate use on elderly people were "largely without foundation". It said that in nearly three quarters of cases people with depressive illness showed "a definite improvement" after ECT. Women were more likely to receive the treatment than men, but the auditors said this was because they were twice as likely to suffer from depression. Only 12% of patients who got ECT were aged over 75. However, the Royal College of Psychiatrists admitted recently that the treatment has often administered by untrained, unsupervised junior doctors but recent guidelines have changed this and ECTAS (ECT Accreditation Services) exist to check that such treatment is being given safely and efficiently.